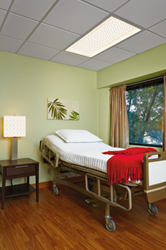 Visa Lighting today announced the debut of their new Serenity product line designed for healthcare environments, including patient rooms, treatment rooms and long-term care. This center panel affords a pleasing design for the environment and helps the patient to feel more at home while creating a serene visual distraction. This is achieved with a choice of four decorative patterns to compliment any design. Additional options include amber LED night light which allows nurses to attend to patient without disturbing sleep cycles and the RGB color-changing LED option for visual interest. Serenity over-bed luminaries are offered in recessed and surface mounted models and are available in 3 standards sizes (2’ x 4’, 2’ x 2’ and a 1’ x 4’ tandem set). Recessed models have a shallow recessed depth to minimize interference with systems within the plenum. Companion fixtures include a Head Wall fixture, Wall Sconce, and Table Lamp. All Serenity luminaries include Visa Lighting’s standard five year warranty. Located in Milwaukee, WI, Visa Lighting products are manufactured and assembled in the United States. Visa Lighting strives to exceed the expectations of our customers, employees and community. We provide tangible value in our products to the customer, support continual improvement opportunities for our workforce and demonstrate commitment to community measured by our stewardship of the environment and promotion of social responsibility. Visa Lighting is an Oldenburg Group Company. For more information about the company, visit http://www.visalighting.com.